Home / Editor's Choice, Entertainment News, Featured Articles, Gossip and Drama, Videos / Angry Nairobi MAN beats a “Fisi” who impregnated his “Anda 18” sister like a dog (VIDEO). 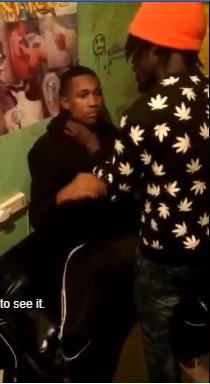 Angry Nairobi MAN beats a “Fisi” who impregnated his “Anda 18” sister like a dog (VIDEO). Monday, August 20, 2018 - A video of an angry Nairobi man beating a “fisi” who allegedly impregnated his “Anda 18” sister is going round on social media. The Anda 18 girl who has been impregnated is a form 4 student. The infuriated man rained on this fisi with kicks and blows and taught him a lesson for messing up with his sister. The guy beating up the young man must understand that his sister had a need the brother CANNOT meet under natural circumstances. Has the pregnant girl reported being raped? No, hence he has taken law in his own hands and should face the law.